You may have made a malicious apk (android package) before on kali, it is done the same way you make a malicious exe. Done by msfvenom. In this short tutorial I will show you how to change the icon, permissions, and name of the app, to make it more convincing for your victim. Something which can be very relevant when you are Social Engineering someone. This will create app.apk in your current folder. You will need to install Apktool on your system, I used windows for this, but it should be done the same way on linux/mac os. Since this is different for everybody I won't cover installing this tool. Check out their website for your system. Do note that Apktool is installed by default in the reverse engineering toolkit from Kali linux! For this tutorial we are only going to modify the AndroidManifest.xml file and the 'res' folder. First off, open the AndroidManifest.xml with your preffered text editor. I am using Notepad++. First off, lets delete a few lines we will probably not need and will give the user an extra warning. Now we are going into the 'res' folder. Here you will find 'values' folder, go into it. Now you will find 2 files, 1 named strings.xml, once again, open this xml file with your preffered text editor. Change '''MainActivity'' to you prefferd app name, I chose the name '''Snapchat''. But choose a name which you seem fit for your situation. Save the file and go back up to the /res/ folder. You will need now to find an appropriate icon set for your app. Name these png files all 'icon.png' and place them in the appropriate folder. You thought we were done? Almost, just one more step. This will create a file named signed.apk in the new folder which you can send to the victim and they will see a familiar app name and icon. Now once the open up the app, you will get an incoming meterpreter shell, sweet right? I hope you enjoyed my (first) tutorial, so let me know in the comments what you think. I like it, nicely written. Welcome to the community. This is something I was looking for! Thank's a lot. I have some questions. 1) How can we make our app starts automatically after reboot to make it much more persistent? 1:) This is a very good question, I will look into it. This should be possible but I think I will have to modify the smali files. Which is a lot more complicated. 2:) binding with another APK is a lot harder. I have found a tutorial I didn't understand, but if you want to have a shot: Click! Great tutorial. Would like to add that apktool is installed in the Reverse Engineering menu in Kali already. Also this would give you a raw apk so you may want to encode it atleast or use some utility to bypass an AV. Nicely written though keep it up! I have added that Apktool is installed by default, encoding an app is something I do not have any experience with but I will look into it for the next tutorial I will make. This was something I was looking for. Thank you. I was looking for this. :D I just want to add that you need to download apktool latest version and update Java for error free apk decompilation. I repaired the link. I will add a mega link in just a minute. But it's not that persistent if the victim's phone is not rooted which in most scenario it's not! Still, I think the best option is binding it with a legit app like AVG, since it asks for lots of permissions already, nobody will get suspicious about it. I tried to compile our backdoor with avg but couldn't make any progress. I completly agree with all of your points, but I don't have the skills required for binding/injecting the code in another app. Let me know any progress you make, I am very interested. I couldn't make it work but there are lots of topics and videos about it. I was having some java issues but I think the problem was my Kali. I'll try this again. I tried this already but since I run the kali framework on my raspberry pi it gives lots of errors, will try it on kali 2 in some weeks, I'm on vacation. So far I downloaded this. One question is how do I get a Cellphone emulator? I do not want to send a file from my cellphone to a target's phone. Can we use an emulator cellphone and send it to the target's phone? will this fool an antivirus(obfuscate)?? That worked! I noticed that it used Dalvik, is there a way to use Art? No. Android module for metasploit has not been updated in ages. Hope they update soon. Ok well it was worth that asking. Thanks again! Gettin error on recompiling app, even on a just decompiled one. Ive noticed that the metasploit exploit only works with LAN connected phones, none on other ips or connections. Is there a way to fix this? Hello Burt, thanks for the tutorial. My apktool is version (1.5.2-1kali1). 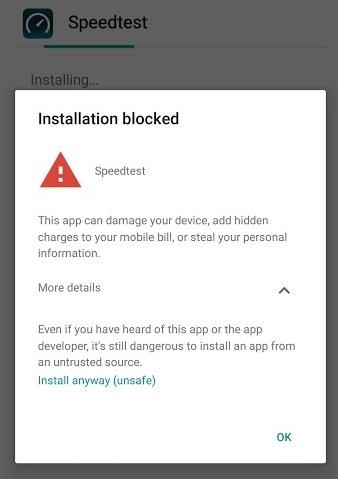 when I want to install the final APK ( infected and signed ), I get this warning, so the victim will see this. how should we stop poping up this warning? but bro u can only get info of phones, which are connected to your network. i mean you can only hack LAN phones with your android app. plsss bro write something about WAN phones hack. Something is wrong with the changes made after you decompile the APK, once you change the manifest, the name of the APK on the res folder and add the icons you cannot recompile the APK again. I have the lates APKtool version "dirty 2.2.1" and it still throws the at brut.androlib.Androlib errors. hey wonderfull post greetings everyone , the final apk is kinda crashing is it problem with MIUI ?